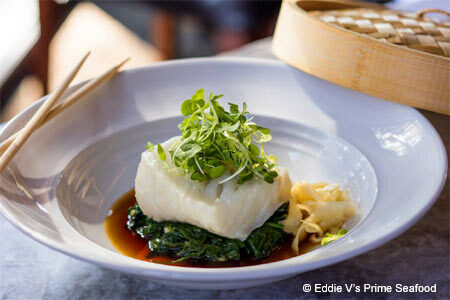 Eddie V’s Prime Seafood delivers fresh fish, an extensive wine list and more. : This stylish Austin import specializes in fresh fish and much more. The menu is tweaked based on what sustainable seafood is available. Whether it’s ahi from Hawaii, Alaskan snow crab or local Gulf Coast red snapper, it’s always fresh and creatively prepared. We suggest the Chilean sea bass with its crisp crust showered with a delicate and lemony butter sauce. If you're a carnivore, take note that the fishery also serves steaks. The space can handle 500 in the elegant main room, two patio terraces and bar area, where live music and a raw bar thrive. Slurp-worthy cold Island Creek oysters and salty Pleasant Points at the raw bar are a meal unto themselves, but save room for chocolate-y confections and the bread pudding soufflé. The wine list is extensive; 2,000 bottles reside in a glass-enclosed wine cellar.